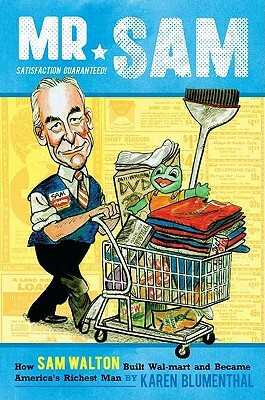 Mr. Sam: How Sam Walton Built Walmart and Became America's Richest Man by Karen Blumenthal. Grades 4-8. Viking Juvenile, July 2011. 160 pages. Review copy provided by my local library. Sam Walton wasn't always rich. He started out as just a regular kid in a small town in Missouri. So how did he create a vast fortune and build a company with stores all over the country? By pinching his pennies, concentrating on serving customers, and always, always striving to beat the competition. I'm always on the lookout for interesting biographies and nonfiction off the beaten path. Maybe because I was the kid who didn't want to do what everyone else was doing. The shelves are full of biographies on Thomas Jefferson, Rosa Parks, and Amelia Earhart. If a kid wants to do a biography report on someone like that, they're all set. But what about the kids who crave individuality? Mr. Sam might just fit the bill. This book isn't a history of Walmart (although there are plenty of fun facts about Walmart and American spending culture along the way). This is a biography of Walmart's founder, Sam Walton, who started with one general store in a small town and worked his way up to owning hundreds of stores worth billions of dollars. Not only is this a book that will fulfill the annual biography assignments, for a certain kind of kid, this is exactly the inspiration they need. Ever since my library began partnering with a local bank to offer a financial literacy program, I've become hyper aware of kids' books that promote money knowledge. This is a great book to add to this list. Sidebars to the story of Sam Walton's life are peppered with information about retail markup, dividing stocks, and profit margins. Blumenthal also throws in information about the culture of the times, mentioning the Civil Rights movement and other things that were going on while Walmart was being built. Of course, Walmart has been controversial for a number of issues and Blumenthal doesn't hide that. She addresses the issues people have had with Walmart - Sam Walton's reluctance to promote women or minorities into upper management, Sam Walton's not paying staff enough, Walmart importing goods while running a campaign about Buying American, and the struggle of small businesses against the Walmart superpower. Blumenthal manages a balanced presentation of these issues, always coming back to the fact that to Sam Walton, customers were king. Black and white photos accompany the text and Blumenthal includes an author's note, source notes, a bibliography, and an index. Mr. Sam is on shelves now! Happy Nonfiction Monday! Head on over to Ana's Nonfiction Blog for this week's roundup!